update on the references experiment. references were off in this period. only 5 requests! no news at all. in fact, the lack of change means another week and I'm closing this study. some 4s for the first time with no references. 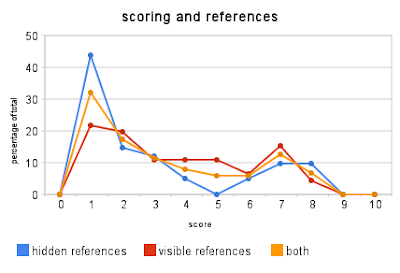 the thing is, I've found, my scoring system is very linear when references are visible (meaning requests come in all qualities). 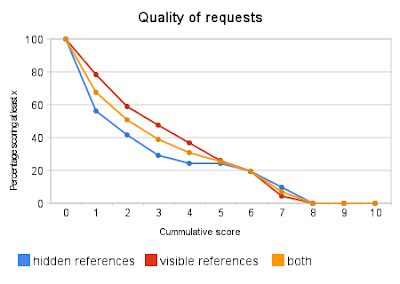 also, less requests when references are off. as for the general quality of what people write, it's just sad. no one ever scored higher than 8 in 10.
also, after I started being more rigorous about the connection between request quality and quality of stay, I've discovered that there is apparently no possible way of telling if someone will be a good guest. there is also no way of telling if we're going to get along at all! whether it is on objective metrics (cleanliness, over consumption) or subjective metrics (were they nice), I can't find any meaningful patterns yet. in fact, it does seem to be mostly driven by my own bias! once I started being more objective, I cleared out a lot of misconceptions. so, not only most people (75%) don't read or care about profiles, reading the profile is meaningless in every way! therefore, a lot of things are fucked up about these hospitality network values. people are looking for a free place to stay, doesn't really matter where as long as the pic is nice and there are some cool references, and reading profiles is pretty much useless both ways. in fact, I would argue, just basic info and references would be enough. again, most numbers indicate that there is no justifiable prejudice, whether it's age, nationality, intelligence, tastes, whatever! it's all about how people interact, and the setting they are in. a carefully designed setting guarantees good times, safety and thoughtfulness. so it's more about the host's behavior that anything else. and so far by my studies, hosts have no objective way of telling what will happen! another guess: the you/me count. definitely high expectations on that.